Student using a computer to access the Internet. Internet communication is having a positive influence on education in and out of the classroom. Educators are adapting curriculum to incorporate Internet applications that support state mandated content standards. The Internet provides the opportunity for people anywhere in the world to access quality educational services from the comfort of their home. The Internet allows you to have access to educational opportunities on your schedule, and at your own pace. 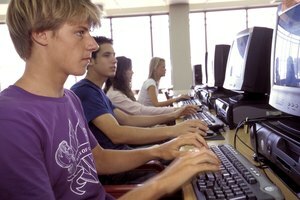 Classroom usage of computers in the United States began in the early 1980s, with applications limited to software packages that provided drill and practice by students. By the early 1990s, most classrooms in the United States had a computer the teacher could use to aid in the presentation of academic material. By the late 1990s Internet usage became widespread, becoming a significant factor in classroom instruction. The late 1990s also saw the rise of Internet based post-secondary educational programs that allow students to earn a college degree without attending a class in a traditional institution. 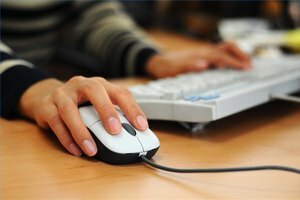 Research shows increased student academic achievement when computers and the Internet are used to support classroom instruction. According to a study commissioned by the Software and Information Industry Association in 2000,"their findings revealed positive and consistent patterns when students were engaged in technology-rich environments, including significant gains and achievements in all subject areas, increased achievement in preschool through high school for both regular and special needs students, and improved attitudes toward learning and increased self-esteem." Internet usage opens the entire world of information and communication to students. Students can access libraries from any city of the world at any time day or night. According to an article developed for blackboard Incorporated, "continual access to course documents also insures students to obtain materials at any time, removing the opportunity for frustrations such as "The Library is Closed," or "All copies of reserve readings were checked out." Students can have 24 hour access to all materials needed to complete an assignment. Students using computer technology and communication tools to research, develop and publish school projects develop critical thinking skills that are essential in decision making processes. In an article written by Bridget A. Ricketts for Prince of Wales Collegiate the importance of teaching internet skills is explained; "teachers need to equip students with a new set of skills which will enable them to locate, analyze, evaluate, and synthesize the vast amounts of information available. Students must become information managers; they must become critically literate." Students who learn to use computers and the Internet proficiently develop competencies that are required in the 21st century workplace. Internet usage allows students and workers to communicate efficiently, increasing productively and facilitating creative thinking. The pace of technological change is forcing students to continue learning new skills and responsibilities. The reality of rapid change will challenge established instructional methodology, and will transform schools into technological training centers. V., Kenneth. "The Influence of the Internet on Education." Synonym, https://classroom.synonym.com/influence-internet-education-6593610.html. Accessed 21 April 2019.